Most of my animations were either humorous shorts, sketch comedy, or sitcom like stories told in parts over several animated shorts. You can read about almost every one of them in this blog if you select the tag GoAnimate (those animations were part of the origin of this blog). One of the things I enjoyed most about creating those animations was carrying over characters from one story into the next, creating my own little TET animated universe. 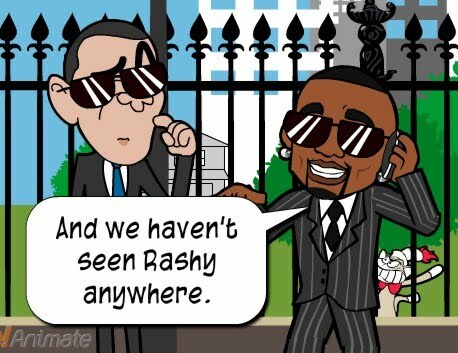 That all started when I took Paul Dini's sock monkey characters, Super Rica and Rashy (licensed by GoAnimate at the time), and re-imagined Rashy as power hungry megalomaniac with visions of becoming 'The Boss of Everything'. If you watch the first four animations in the playlist below you can see the evolution of Rashy, from the original stand alone short, through to him becoming a super villain when I mixed him with Underdog's world (another set of characters licensed by GoAnimate at the time). Note these animations are from 2008-2009 when dialogue was mostly done with speech balloons rather than voice actors on GoAnimate. MIB with Obama and AKON. 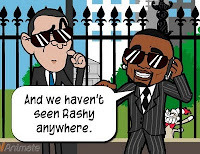 From there Rashy went on to appear in my Men in Black parody staring AKON and Barack Obama as two MIB agents. As well as it's epic sequel MIB II. All of these shorts had some of my best comedy writing and probably would have continued if GoAnimate hadn't decided to not renew the various licenses on the characters you could animate. 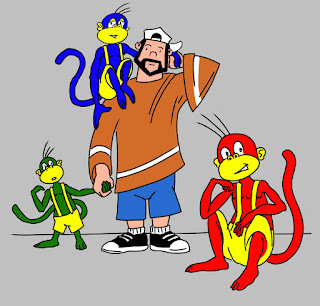 Recently it occurred to me that I've had my own monkey characters, that I designed way back in the early 1990's. Lately I've taken to calling them 'color monkeys' because they're all the same kind of monkey but they can be either red, green, or blue. I could easily reboot the fun I had with Super Rica and Rashy but with my own original characters. 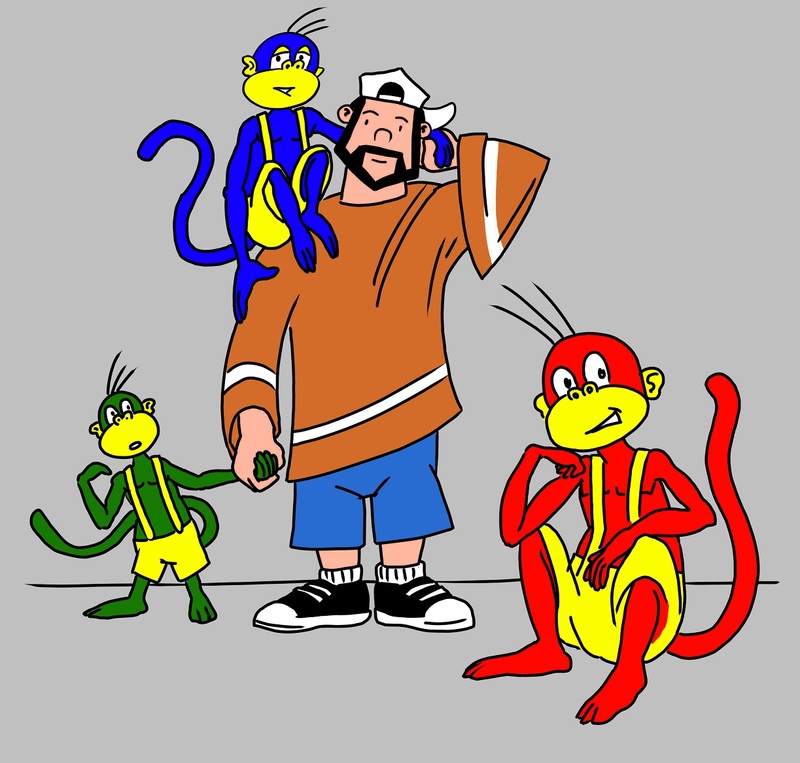 So I did a slight redesign of my monkeys feet - because their original, impossibly big, human like, feet make them difficult to animate - and gave each one a name, kind of inspired by Paul Dini's characters; Reddy, Super Bluey, and the Great Greensbury (guess which name goes to which color of monkey). I like the idea of them being owned by a Hollywood script writer, so rather than create someone kind of like Paul Dini's 'Dad' character I thought, why not just use Paul Dini's friend, writer/director, Kevin Smith as a base? I'm a huge fan of Kevin so why not? Just to be clear, although the character's look and occupation is based on Kevin Smith, it's not actually meant to be Kevin Smith. Over time his personality will develop. I just don't see the point in trying to design a totally original character when creating a Kevin Smith like analogue will give me a base to build upon into something that's my own. From these four characters I could easily build a world of my own characters (I have so many I've designed over the years) that I feel audiences would enjoy as much as the GoAnimate community enjoyed my work there (at the time I was one of the highest viewed GoAnimators on GoAnimate). 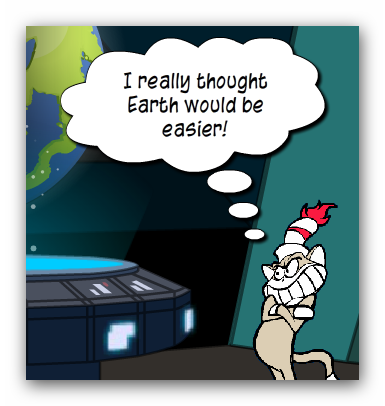 Transferring some of the ideas from those past animations into fresh new takes and stories really does sound fun to me. I feel, with this idea, I'm in a good place moving forward.